Product prices and availability are accurate as of 2019-04-15 01:48:35 EDT and are subject to change. Any price and availability information displayed on http://www.amazon.com/ at the time of purchase will apply to the purchase of this product. 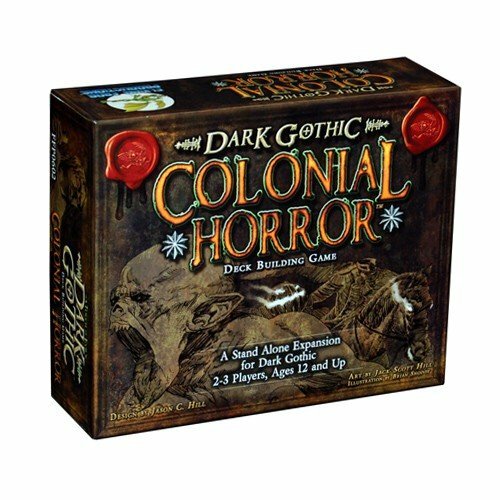 Dark Gothic: Colonial Horror is a Stand-Alone Expansion for the Dark Gothic Deck Building Card Game. It can be mixed in with the original Dark Gothic game to add new mechanics and greater variety, or it can be played on its own as a 2-3 player game that is fast, fun, and deadly! In Dark Gothic, each player takes on the role of a unique monster-hunting Hero, collecting Allies and Gear to aid them in their journeys while they root out evil and hunt supernatural creatures back to their lairs. Players must hunt down a series of increasingly difficult Villains that are terrorizing the countryside before the land is consumed in shadows. Though the Heroes must generally work cooperatively as a group to stop the Villains from overwhelming the land, there can be only one top monster hunter amongst them when the dust clears and the final victory total is gathered. Dark Secrets lurk around every corner and only the most cunning and spirited hunter can prevail in the age of Dark Gothic! Ages: 12+ Number of Players: 2-3 Dark Gothic: Colonial Horror is a Stand-Alone Expansion for the Dark Gothic Deck Building Card Game.